It's Irish Saison beer night tonight, for no obvious reason except that I was gifted a couple of bottles at the Irish embassy's craft drinks night last month. 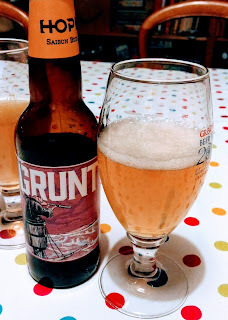 First up is Grunt, a 4.8% Saison from Dublin-based Hope Beer, a name that's new to me, although it turns out they're almost three years old. It pours with an aroma that puzzled me for a moment, then I realised: gin! A check of the label, and yes, this is that relatively rare thing, a spiced Saison. Most brewers let the yeast and hops add the spicy notes, but this one has added juniper, lemongrass and bergamot. The result is initially disconcerting – the spices overpower the Saison flavours, with a dry-edged bitterness that doesn't invite one to quaff. Read the label some more though, and it becomes obvious that this is a beer for drinking with food, not merely for drinking! Hope suggests pairing with seafood or cheese, and sure enough, a slice of the latter lifts and brightens the flavour of the beer considerably, smoothing the harsh edge in the process. I was impressed – generally one tries to find a pairing where good beer and good food complement each other; rarely does one find a beer that really shines when drunk with food! 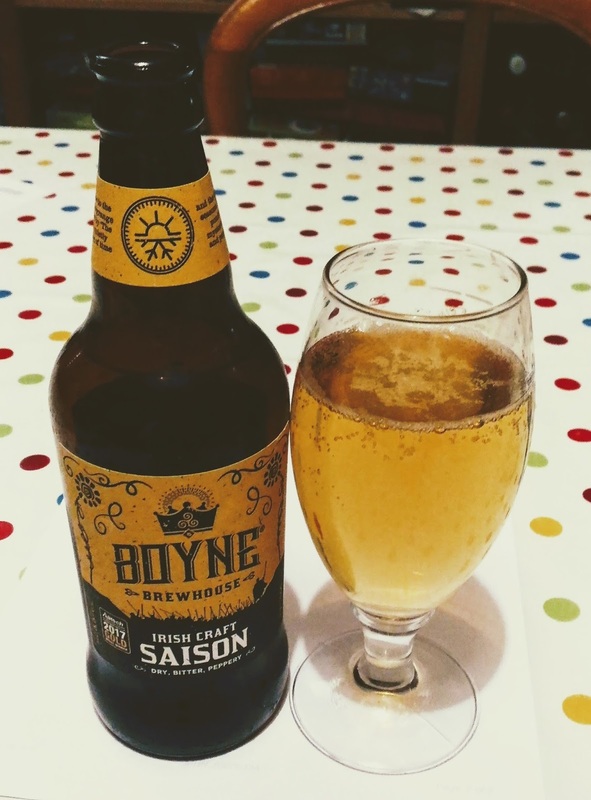 The second comes from a brewery I already knew, Boyne Brewhouse of County Meath, but when I last spoke with export director Peter Cooney, I think they were still contract-brewing while they built their own brewery. Two years on, it was great to see how the beers have improved – they were decent then but a little pedestrian, now they are solid, with an expanded range that includes some brilliant beers. It helps that it's part of a larger group that also makes whiskey and cider – for example, I tasted Peter's prize-winning barrel-aged Imperial Stout, which spends four to six months in casks that once held sherry, but more recently held his Boann whiskey for 30 months. It was gorgeous, but more intriguing still was the fact that he's now cycling the casks back again, so after the beer they are refilled with spirit to make Stout-barrel-aged whiskey, then he'll refill with beer, and so on. "I'm not sure how many times I can do it though," he laughs. Anyway, Boyne's Irish Craft Saison doesn't disappoint. It has the classic Belgian estery and slightly funky nose. There's lemony golden malt, firm peppery and pithy bitterness, a touch of peaches and cream, and at 5.5% a light chewiness to it. A little too gassy for my taste, but otherwise a very well-executed example.